I was recently offered the opportunity by Hamilton Beach to review their Hamilton Beach Set & Forget 6-Quart Programmable Slow Cooker. Every few years or so I get the urge to use one, so I thought "why not?" I responded to the offer and within two days I was looking at a brand new slow cooker. Full disclosure: I have not had much success with slow cookers in the past, other than keeping Chili con Queso warm and dippable at parties. They are also good for cooking dried beans and making stock, but I have not been a big fan of any other dishes I have tried to make in them. I think one of the reasons I was not a big fan of them for much else is because they tend to cook everything to the same consistency, and vegetables always came out overcooked with an odd taste that seemed to come from a lack of oxygen caused by the seal created by the process. I am sure that is not the case, but psychologically that is the best way that I can explain how it tastes to me - as if the vegetables suffocated for lack of oxygen. And because I did not like the way vegetables came out, I wasn't going to risk more expensive items like meat, especially if it was going to have that weird aftertaste. So I would use it for a few reliable dishes every now and then, try a vegetable dish, get put off by that weird aftertaste, and put it back into storage for another few years. I was somewhat hesitant to take advantage of this offer for that reason, but then I decided maybe it would be good for me to try it. I know the technology has changed quite a bit since the last time I bought a slow cooker, so I decided to request a review model. This is not new to the slow cooker world, but I have not had an oval model before and I liked that right away. It seemed to suggest meat, being shaped more like a roaster, so I decided to make my test recipe a meat-based dish, both to give it a fair shake and to meet the "fall cooking and bringing families back to the dinner table theme." I was also curious to try the probe, which allows you to program the cooker to switch to the warm setting once the dish reaches the desired temperature. To give it a fair shake, I tried a few recipes to put it through its paces. I used the manual setting, the programmed setting, and the probe. I cooked a pork shoulder, chicken, and vegetables. The eggplant and peppers came out with that weird aftertaste I get with all vegetable dishes. I used the programmable setting for the pork shoulder and that came out just fine. But what makes the Set & Forget worthwhile to me is the Probe setting. 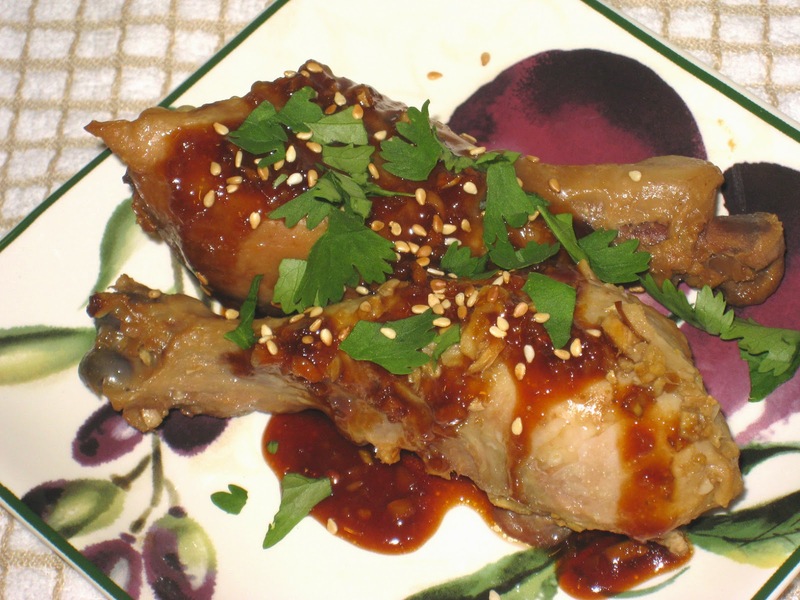 I used it for making the Honey Orange Chicken Drumsticks pictured above, and it was delicious. The chicken was cooked through but not overdone as my chicken so often is, since I did not have to worry about undercooking it. I found the recipe in the May/June issue of Eating Well magazine. There were actually a few slow cooker recipes in that issue that looked appealing. It was easy to make and delicious. I served it over cilantro rice (which is my dill rice with lime and cilantro in place of the lemon and dill) with my Napa Cabbage Salad with Snow Peas and Toasted Almonds on the side. It was a big hit and the leftovers travelled well for workday lunches the next day. The bottom line? While I wouldn't say that it is a necessary appliance and you should run out and get one right away, I am glad that I have it and will continue to use it, especially for braised meats. If you are a heavy slow cooker user and are looking for a new one, this would be a good choice. I did not make any changes to the original recipe so that I could be more objective in my review of the slow cooker, so I will just point you in its direction. You can find it here. (My photo will definitely suffer in comparison to the original, but I can assure you that it had no impact whatsoever on the way it tasted.